Prince Harry and Cressida Bonas have broken up, wreaking havoc among members of the royal family. Just one month ago, Harry and Cressida were seemingly on the verge of getting engaged, but here we are a month later, and they’ve gone their separate ways. There are many conspiracy theories floating around about the cause of their breakup, but the one that we’ve most heard bandied about is that Kate Middleton had a hand in the split. For those who haven’t kept up with their royal history, Kate and Cressida actually have a prior connection, before Cressida and Harry started going out. Cressida’s half-sister, Isabella Calthorpe, used to date Prince William, way before he was committed to Kate. In fact, Will was reportedly so crazy about Isbaella that he proposed to her, but she ended up dumping him because she wasn’t interested in joining the royal family. Of course, we all know how hard Waity Kaity worked to land Will, right? She and her mother deferred her admission by a year, and manipulated the situation so she would end up at the same college as Will. After all that hard work, and after Will’s breakup with Isabella, she swooped in and became the future Mrs. Cambridge. And achieving her dreams, you think she’d let her position get jeopardized by her brother-in-law’s romantic liaisons? Never. See, Kate couldn’t stand the idea of Cressida marrying Harry – not because she had anything against Cressida, but because Cressida was a constant reminder of Will’s history with Isabella. If Cressida and Harry were to get married, that would mean that Isabella Calthorpe would be accompanying them on family vacations, royal events, and generally everything they did together. 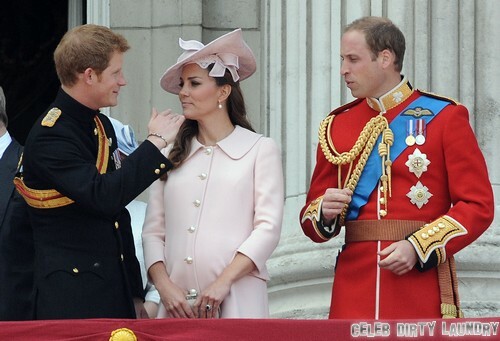 She would be around all the time, and considering her history with William, of course Kate was jealous and anxious. It wouldn’t be the first time a royal cheated, and it definitely wouldn’t be the last. Anyway, Kate thought all that through, and she decided that the best way to prevent anything from happening was to literally prevent anything from happening. Thus, she went ahead and whispered into Cressida’s ear, telling her that she didn’t really want this, that she would be much better off living an independent life, and pursuing her passions and dreams. For someone in Cressida’s position, joining the royal family probably wasn’t all that appealing, especially since she had a bright future ahead of her. Unlike Kate, Cressida didn’t plan her entire life around getting married to Harry, and in fact, joining the royal family would just inhibit her ambitions, not increase them. So Kate’s interference worked, and Cressida broke off the marriage. However, that left Harry heartbroken, despite royal ‘sources’ making it seem like the split was a mutual decision. And now that Harry’s started to put two and two together, he’s extremely angry and annoyed that Kate interfered in his private life. Plus, he’s angry at William for supporting her, instead of telling her off for what she did. Of course, Harry and William have weathered worse situations than this, and they’ll definitely get through this just fine. But I wouldn’t be surprised if Harry’s relationship with Kate was permanently damaged after this, or at least, on tenterhooks for a long time.